The U.S. State Department has congratulated the Maldives’ on its peaceful democratic election. Opposition candidate Ibrahim Mohamed Solih declared victory in Sunday’s vote, which was widely seen as a referendum on democracy in the nation that was holding only its third multiparty democratic elections. The nation’s strongman president hasn’t conceded, and official results won’t be announced until Saturday, allowing possible court challenges of the vote. State Department spokesperson Heather Nauert noted the reported opposition victory in a statement that urged “calm and respect for the will of the people” as the election process concludes. Opposition presidential candidate Ibrahim Mohamed Solih has declared victory in the Maldives’ third-ever multiparty presidential elections. The opposition had feared the election would be rigged in favor of Maldives’ strongman President Yameen Abdul Gayoom, whose first term in office was marked by a crackdown on political rivals, courts and the media. Election officials in the Maldives say voting has ended in the South Asian island nation’s third-ever multiparty presidential election after the polls were kept open longer than planned due to high voter turnout. An elections-eve raid of the opposition presidential candidate’s main campaign office cast a pall over Sunday’s election, widely seen as a referendum on the Maldives’ young democracy. But it did not appear to deter voters, who waited in rain and high temperatures to cast ballots. Authorities in the Maldives say voting hours have been extended to accommodate high voter turnout in the country’s presidential election. Democracy was introduced to the Maldives, a former British protectorate, in 2008 after decades of autocratic rule. Incumbent strongman President Yameen Abdul Gayoom’s only opponent in Sunday’s election is longtime opposition lawmaker Ibrahim Mohamed Solih. Party officials say no arrests have been made Sunday after an elections-eve raid of the presidential opposition candidate’s main campaign office in Male. The raid has cast a pall over Sunday’s elections, widely seen as a referendum on the island nation’s young democracy. 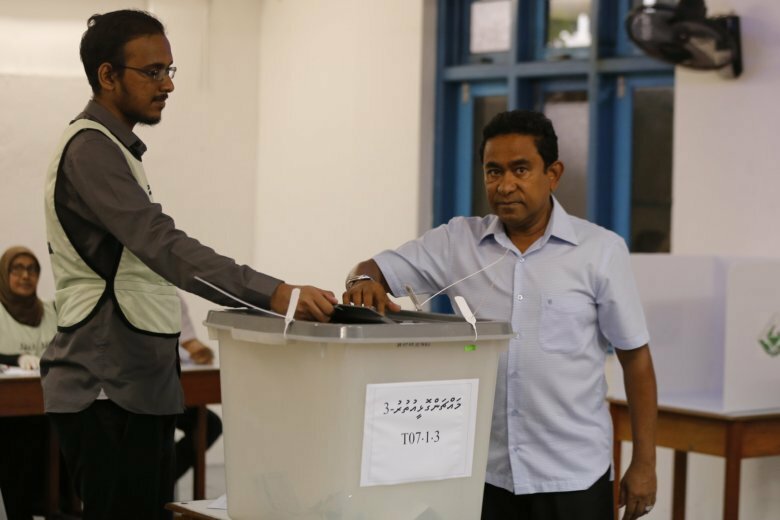 The opposition says it bolsters fears that the vote will be rigged in favor of the Maldives’ strongman President Yameen Abdul Gayoom. Voting has started in the Maldives in a presidential election that is widely seen as a referendum on the island nation’s young democracy. Police raided the opposition presidential candidate’s main campaign office on Saturday evening, citing a warrant to search for evidence of vote-buying.